Refrigerators are usually the most reliable household appliance that rarely needs much attention, yet if there is a probably that arises it can be a very big inconvenience because everything inside of it can be ruined. There are many individuals who do not even realize that anything is wrong with their fridge until it is too late, most of the time. 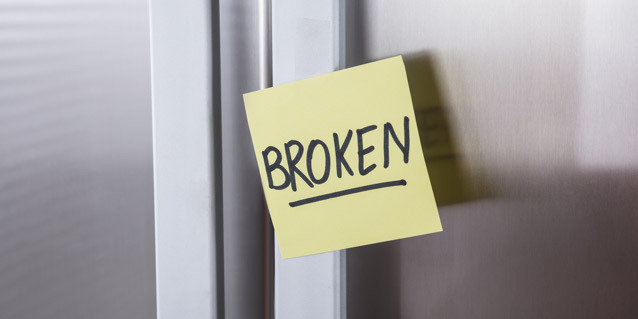 There are many signs that you can look for to determine whether or not you might need to get repairs done on your fridge before it completely stops running. There are many signs that show your fridge is in need of repairs such as excess condensation. If you notice, in warmer weather, that your fridge is sweating, it may mean that it is not cooling properly. It is important than when you notice this is happening, you check the rubber sealing around the fridge for any loose edges or even signs of mold and mildew build up. Most of the time this is an easy fix, which makes it inexpensive for you since you can repair it yourself. If you notice any of the products inside of your refrigerator is sweating, then you may have a problem with the temperature control system and should have it looked at immediately. Another sign that is easy to see, is if you open the freezer part of your fridge and it is starting to look like an iceberg inside of it, then you should take action. Obviously, you want your freezer to be in an ice cold state so that you are able to keep the food frozen that you need to, however, you shouldn't have to chisel and chip off a ton of ice just to get into your freezer. If you notice that this is beginning to happen, you should immediately defrost your freezer, then plug it back in and make sure to monitor it's activity after doing this. If it does it again, then it may be a sign to purchase a new refrigerator. Most of the updated fridges usually have an automatic defrosting system before it becomes too cold, therefore, if you have an older model, it may be time to think about getting a new one. If a refrigerator is over 10 years old, then the repairs could end up costing you very much, and in the end it could end up costing you more than just replacing it with a newer model. It would be more beneficial to you to purchase a brand new model. One other very noticeable sign that your fridge may need some work, is if you can hear it running. Refrigerators do make noise when they are running, however, they are usually very quiet and shouldn't be extremely noticeable. If it has a loud running noise, then it may be beneficial for you to have a repairmen come and check it out. There could be any underlying issue with your refrigerator, and you will need to have it checked to see if it is able to be repaired, or if you should invest in a newer one. In conclusion, there are many signs that will indicate that your fridge needs some attention. Making sure to fix these problems are prudent, and the best way to make sure your fridge continues working well is to hire a fridge repair Singapore technician like us. Whenever you feel your fridge may be showing any obvious signs that it may be going down, try to have it looked at as soon as possible so that you can make sure you have an appliance that is reliable and keeping your products inside at the temperature they are needing to be.